I seriously think the best part of living where I do is that I have easy access to the theme parks. The one personal indulgence we do take is having annual passes to Disney World and Sea World. My personal favorite place to visit may have to be Epcot…but Animal Kingdom is pretty darn close. I love Epcot. I love to walk from country to country and look at the buildings and watch the performers. The food is absolutely amazing and it, truthfully, is the best place to go and get ethnic food in this area, since you can trust the taste and quality of the food and beverages. I especially enjoy the Food & Wine Festival that they host every Fall, where they include multiple additional countries and offer small, authentic dishes and wine, beer, etc. I have found myself getting into the habit of always making a beeline straight for Japan and noshing Katsura Grill, a very decently priced restaurant. It is actually the cheaper of the two Japanese restaurants that are available to eat at. Most of the countries feature at least two restaurants, one with meals costing, typically 14.99 and under and the other costing 14.99 and up. Of course, a lot of them feature small stations where you can get drinks, treats and snacks for fairly cheap. In France, there is a crepe shop, a patisserie, a place to get champagne. In America you can get funnel cake and turkey legs while in Mexico you can get churros and margaritas. If you want to go a more expensive route, there are also restaurants that have very grand meals, France, for example, has a 5-star restaurant called Bistro de Paris tucked away on a second floor that features a very unique menu that confused me more than enticed me. They have a prix fix menu that can be paired with wine and has 4 courses, all indulgent and filled with items I haven’t even heard of before. One day, when I hit the lotto I can have the chance to swagger up the stairs and eat food that will probably blow my mind. Last night, though, I wanted to have an indulgence that has scared me for many months now. It’s totally ridiculous, but Chinese food has been a very elusive creature since our move from the great north east, where Chinese eateries are everywhere and absolutely worth the grease. Here, on the other hand, you are handed iffy food that has no flavor. I ate take out from a Chinese Buffet here that featured rancid meat. The worst part is that it was my absolute favorite guilty pleasure, sweet and sour chicken. Biting into something that literally tasted and smelled like rotten gym socks and dead bodies had ruined me. For weeks I would get sick at the mention of Chinese food. It completely ruined my love for Chinese take out and the only way I could even fathom looking at Chinese food was at mall eateries and even then I’d completely turn my head and want to dry heave. I couldn’t hold out any longer. I had moved passed this incident and I wanted Chinese food, made by Chinese people. I wanted it to be delicious and trustworthy. So, what better place then going to Epcot, where people from China prepare the food, right? Rather than go to the open air and more inexpensive restaurant, we opted for the slightly more expensive Nine Dragons Restaurant. At first I was a little intimidated by the drink options. I usually drink bottled water when I eat out because I don’t drink soda or juice straight and I don’t trust tap water. When Mr McDorkin pointed out that they had chai tea, I squealed like a little girl. I ordered the hot chai milk tea. I seriously believe this was my best decision all night. The tea was so sweet and tasted like a spice cake. I loved it. I could fill a bathtub with their chai milk tea and sit there with a straw and go to town. 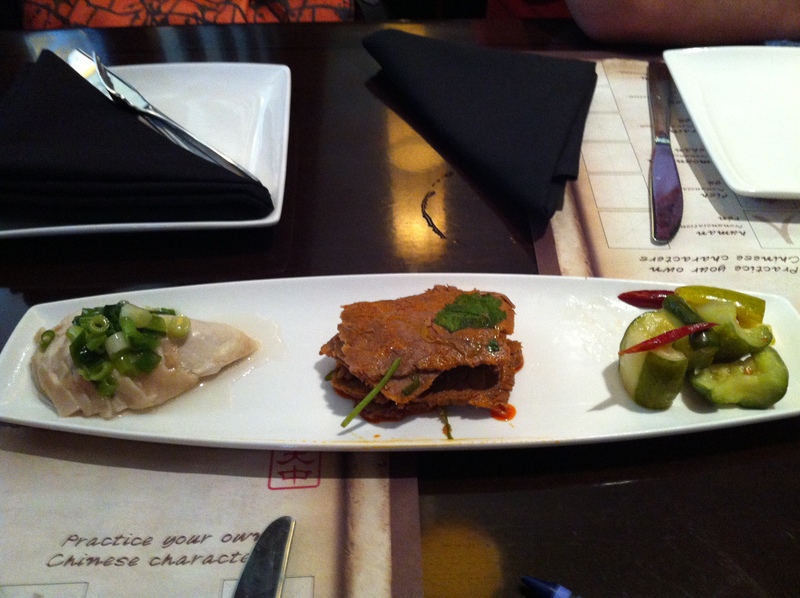 We ordered the cold trio appetizer(Cucumber Salad, Spicy Beef, and Fragrant Chicken). Mr McDorkin helped himself to the first bite of the cucumber salad and then turned bright red and started having a coughing fit. I thought he was choking but apparently he got lucky and ate one that was covered in whatever spice they sprinkled on top. Once that passed I had one, too. It think I may be addicted. It was so sweet and had the perfect amount of sour and spicy. The fragrant chicken wasn’t our favorite. It was a little strange to have cold chicken and it had no flavor. It seemed to be more reminiscent of boiled chicken with scallions on top. The spicy beef was very addictive, also. It wasn’t very spicy so much as it was very flavorful. I found myself going back to the cucumber and beef and Mr McDorkin definitely showed love to the spicy beef. The main courses came out super fast. I was very surprised at the speed, especially since I felt like we had only a few minutes alone with the appetizer and it had been maybe 10 minutes since we put in our order for the main course. Baby McDorkin had sweet and sour chicken. Of course, he was more interested in the sauce than anything else. He ate everything on his plate except some carrot sticks, which he had tried to use as spoons to get more sauce into his mouth. I ninja’ed a bite of his food and it was pretty darn good. 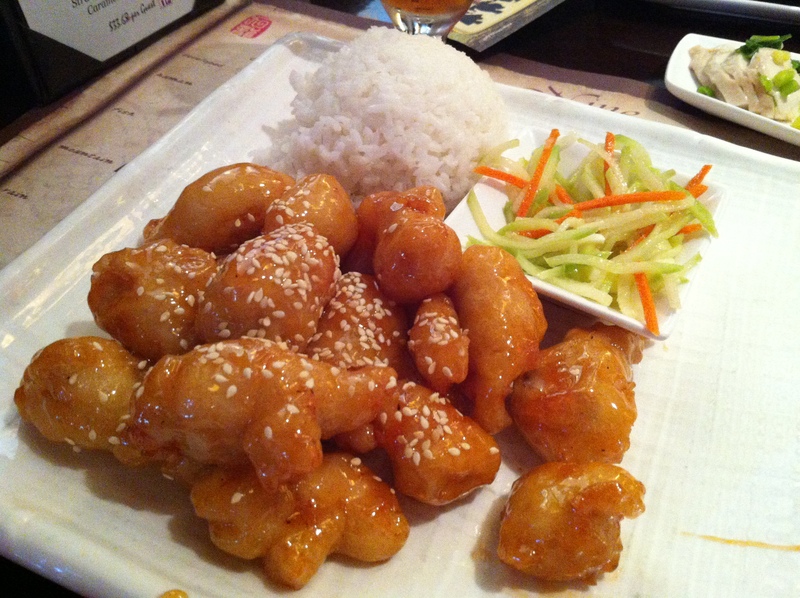 Mr McDorkin opted for the honey sesame chicken. I can’t say I was surprised, since he either gets honey chicken or cashew chicken and that wasn’t on the menu. I ninja’ed a bite and I thought it was quite scrumptious. The breading was nice and crunchy and the honey sauce was not too sweet and had a great flavor. I like to change up my chinese food orders and try something new now and again, since I notice people get in that rut where they order the same thing every time. Those big menus are pretty intimidating. 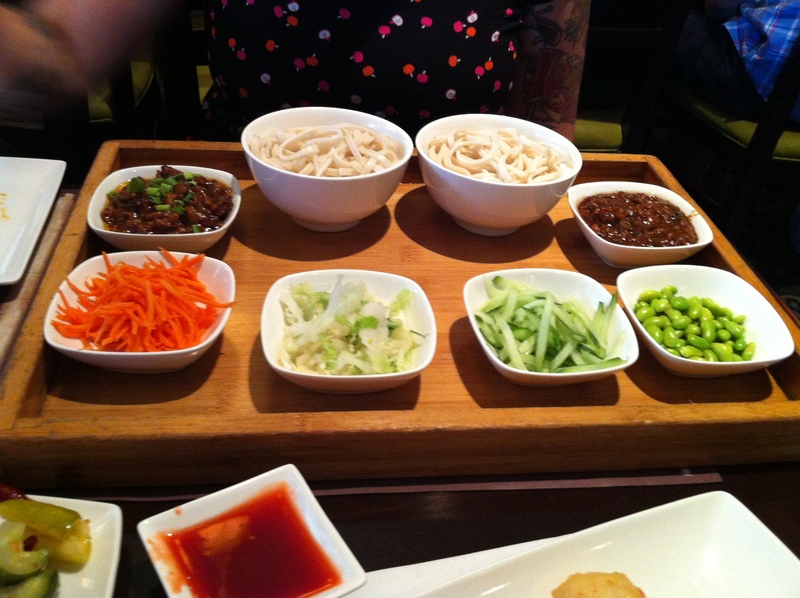 The menu here wasn’t too huge so it only took me a few minutes to chose zha jiang noodles sampler. When it came out, all I could think was that it looked like someone’s school lunch. Two bowls of noodles, cut up veggies and two meat sauces. The chicken sauce was my favorite, it had great flavor and kind of reminded me of the red bean paste used to give food a little bite. The pork sauce was super salty to me. Some of the veggies tasted a little odd to me. I ate probably less than half of what was on my tray and I felt like I had cement poured into my stomach. I haven’t been eating much wheat and these big noodles and the oils in the sauces were just too much for me to handle. I had indigestion from that point on. It hurt to breath and I was burping an odor that is reserved for chinese take out. I don’t think I’d touch that dish again unless I was getting paid for it. Our bill came out to $80 after the tip and I was so disappointed that we spent that much money on dinner since it just made me feel like crap. I would have rather went to the cheaper restaurant and just bought the kid’s sweet and sour chicken and paid $30 for all of us, with dessert. In other news, we did get dessert at the Edy’s shop. Mr McDorkin had the mint chocolate chip and I had a strawberry smoothie. Yumm-o!! We skipped out on the fireworks and took the baby inside of the ‘big ball’ and boy was he overjoyed. This entry was posted in Food, Uncategorized and tagged attraction, china, chinese food, disney, disney world, dragons, edy's, epcot, food, nine, opinion, restaurant, review, vacation, world by themcdorkins. Bookmark the permalink.